Our family is mostly the kind of folks that love their meat and potatoes. Potatoes can be baked, fried, boiled, microwaved, creamed, or mashed–fresh, frozen, or flaked. It doesn’t matter. But, we also have a few allergies in our family…so… just to be safe for everyone, dairy and nuts and wheat and eggs and soy are out! So, even our simplest recipes have to be “different”. But I make a Light & Fluffy Dairy-Free Mashed Potatoes that’s so good, you won’t ever want to go back to milky-mushed-taters. Heh. 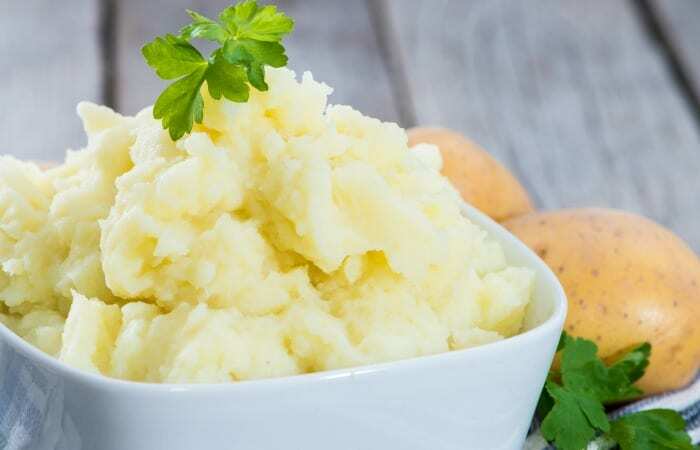 Now, I’ve tried making mashed potatoes with coconut milk, but I don’t like that coconut-ey-sweet flavor in my taters (and there’s no way to cover it, I tried). 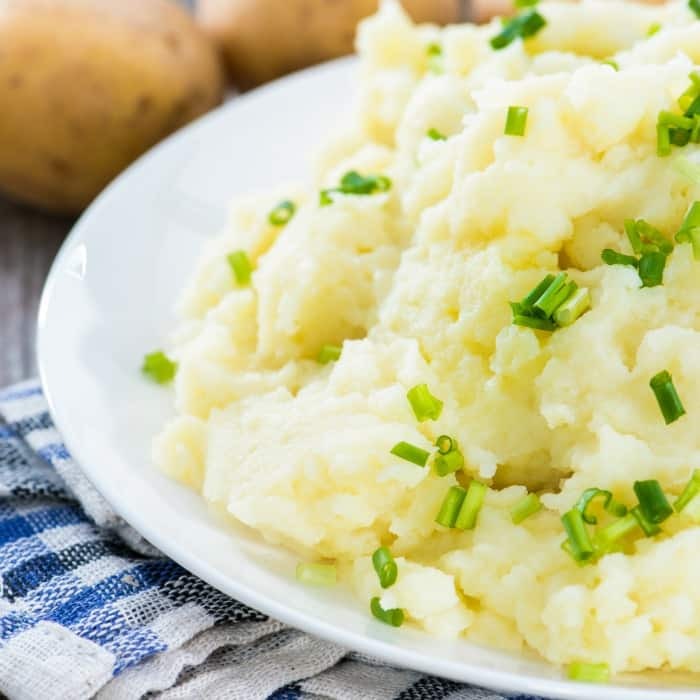 I then attempted making mashed potatoes without any added liquid, but I don’t like that texture–and it’s kind of boring. So, we came up with adding some chicken broth. WOW! What a great taste! 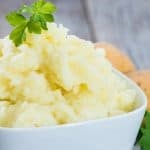 I’ve been making mashed potatoes since dirt was new, but this recipe for dairy-free mashed potatoes blows them all out of the water. 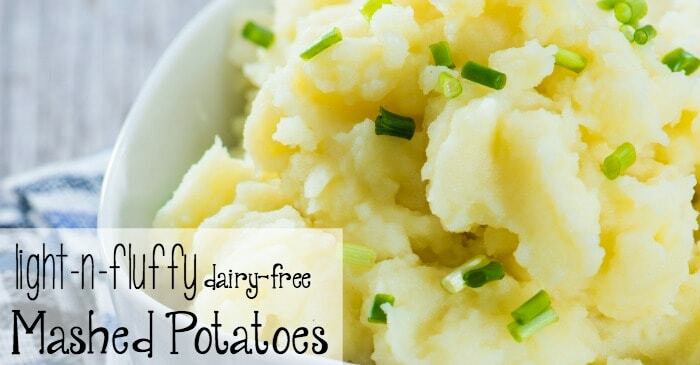 I make a Light & Fluffy Dairy-Free Mashed Potatoes that's so good, you won't ever want to go back to milky-mushed-taters. Heh. Peel the potatoes (or not). If you don't want to peel the potatoes, then scrub them very well under running water. Cut into squares about 1/2 inch, or smaller. You should have about 4 cups of cut-up potatoes. Place potatoes into a large pot or dutch oven, cover with water, plus about 1 inch, place over high heat and bring to a boil. When the potatoes begin to boil, reduce the heat to about medium--but make sure the potatoes continue to boil slowly. Stir occasionally. Boil for about 20 minutes, or until potatoes are tender and cooked through. Remove from heat and drain in a colander, then place potatoes in a medium-sized glass or plastic bowl. Add a pinch of garlic powder and about 1 cup of Chicken Broth. Using a hand-mixed, beat on low speed for a minute or so, then increase mixer speed to break up any potatoes pieces. The potatoes should be easy to stir, but not "soupy". Add more Chicken Broth as needed to reach the desired consistency, and mix. Add salt and pepper to tasted. Be careful not to add too much salt, as the Chicken Broth may be pretty salty. Let me know how yours turns out! Leave me a comment below, or on Facebook!